When it comes to a food processor for your kitchen, you’re most probably looking for something that can do it all. Beyond just blending the odd juice, soup or pesto, you want a durable blender that’s not only going to last, but going to be versatile in terms of what you can use it for, and what you can put in it. In this post, we compare the Cuisinart vs Kitchenaid food processor – two of the best on the market. Both the Cuisinart DLC-10 and the Kitchenaid KFP meet these standards. They’re pretty much the cream of the crop of food processors, both in features and ability. But what makes them such good food processors? And which one is better? Well, stick around for a bit longer, because we’re about to dive deep into each of these food processors, and answer those questions for you (as well as a whole load of questions you probably didn’t even know you had). We’re going to compare them on a number of points, with a buyer’s guide too, as well as our overall choice at the end of the review. Let’s get blending. What is a Cuisinart? / What is a Kitchenaid? Cuisinart and Kitchenaid are both long-time kitchen appliance manufacturers, with great track records and a history of products that not many other companies can boast about. Kitchenaid is the older sibling in this situation, with their brand turning 100 this year, although Cuisinart has caught up spectacularly in the 40-ish years it’s been around. These two companies make some of the best and most reliable kitchen appliances. Their reputation for being reliable and solid are what has made them the two best products on the market. They also stand behind their products with a money-back guarantee. The food processors that we’re reviewing today are meant to make your job in the kitchen easier by helping with preparation. They blend, mix, stir, chop and slice with ease, taking the bulk of the prep away from you. Now, both food processors we’re reviewing here are just about the same – in a way, it’s each company’s take on the same size and style of food processor. To help weigh up the options, find out which stands out where, and to see which one suits you best, we’ve reviewed each one and compared them on a number of criteria. The four sections below, namely features, abilities, build quality and price; are the four biggest comparing factors we thought the two blenders clashed upon. We’ve broken them down in depth, so let’s take a look at the results. One of the best ways to see exactly what you’re getting and how they behave is to watch the product videos offered by each company. Watching these quick 4-minute videos will help you visualize the comparisons between the two models. Cuisinart or Kitchenaid Food Processor – Which Has Better Features? When comparing features of these blenders, it really is hard to discern which comes out on top. They’re near identical, but with a few little differences here and there. They both come with three chopping attachments. There’s an S-shaped chopping blade, made from stainless steel, for your regular coarse chopping of ingredients. This would usually be used for things such as chopping an apple into small pieces to make an apple sauce. It also acts as a dough blade, but you’ll need to do some experimenting to make sure you don’t use it in a manner that ruins your dough. There’s a versatile shredding disk which could be used for dishes such as coleslaw, salads, or even prepping stir fry ingredients. Both blenders also have a slicing disk. 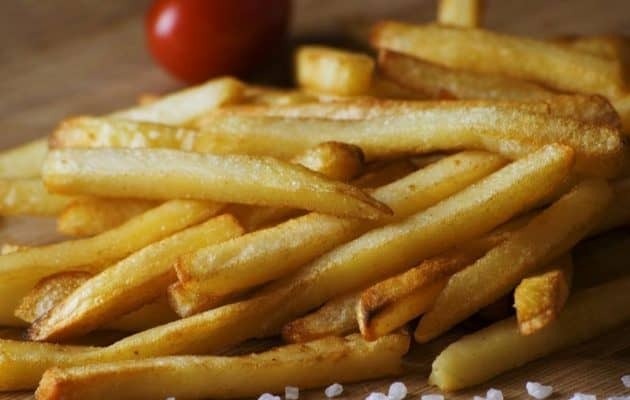 This would be used for thin slicing of just about anything – for example, one could use it to slice potatoes to make the perfect potato chips. In terms of blending speeds, the Kitchenaid comes out on top. It’s got a low, high, and pulse setting range, whereas the Cuisinart model simply has on, off and pulse. The adjustable nature of the Kitchenaid model adds just that much more control which can have a huge impact on the end result of your dishes. The Cuisinart comes with a heavy-duty 600-watt motor, while the Kitchenaid only has a 300-watt motor. If you’re going to be doing any heavy-duty chopping, or if you want this machine for mixing dough, you’ll absolutely want to choose the Cuisinart. When it comes to capacity, these are both 7-cup blenders. However, both brands come in larger and smaller sizes. They also both feature dual-size feeding tubes. The larger tube is built into the lid of the food processor. You can put full-sized or large ingredients in for shredding or chopping. If you need to feed a smaller item through and are looking for precision slicing, you can use the smaller feeding tube insert. The smaller feeding tube fits inside the larger one on both models – it would be best used for more fine actions like slicing, or making sauces or dips where you want to gradually add ingredients to get that perfect flavor profile going. The Cuisinart runs a little quieter than the Kitchenaid does, but neither of them are especially noisy. They don’t have the noise level of a typical blender, where you can’t hear a conversation over the sound of the machine. One of the bigger complaints people have about the Cuisinart food processor is that it lacks the UltraTight Seal feature of the Kitchenaid. This feature has a specially designed locking system with a leak-proof ring that allows you to fill the blender to absolute capacity without worrying about making a mess. 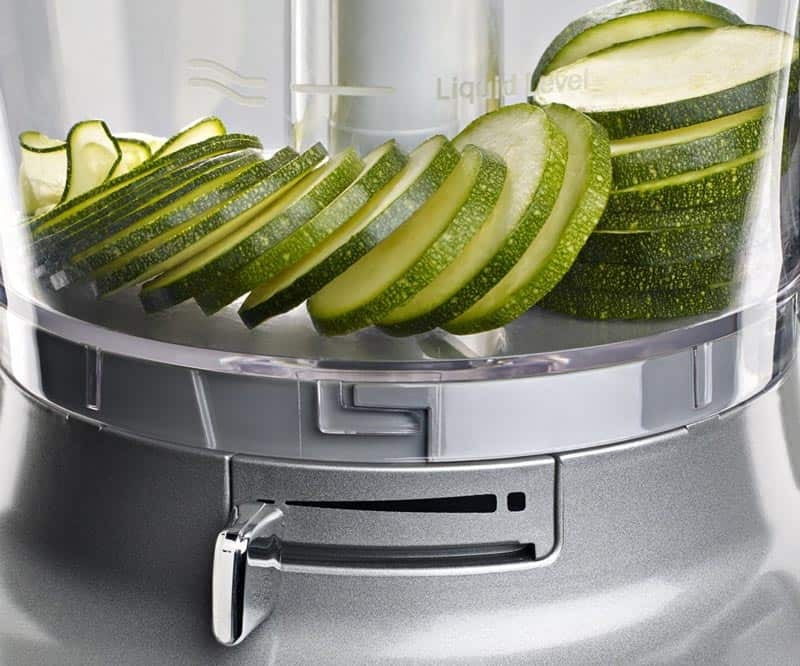 With the Cuisinart, you have to be mindful not to fill the cut over halfway full or you’ll have a mess on your hands. As with most of the comparisons between the Cuisinart and Kitchenaid, there’s not much room for comparison between prices. They’re both around the same price – hovering right around $100. However, they both regularly go on special making them equal contenders for better ‘value for money’. 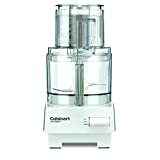 What is the Kitchenaid or Cuisinart Food Processor Best Suited For? In terms of what foods or ingredients these food processors are best suited for, they both can easily tackle things like chopping, grating, and slicing of any vegetable with ease. They are both great for making dips, salsas, pesto, and sauces. The Cuisinart is better suited for mixing dough. The tougher the project, the more well suited it is for for the Cuisinart, because of it’s higher wattage. The Cuisinart also has a better shredder attachment than its counterpart, according to reviews. The Kitchenaid shredder isn’t as good at shredding thick ingredients, like mozzarella or cheddar cheese. Cheeses can get trapped in the shredder disc and make it hard for the machine to continue its work without overheating. You likely won’t encounter any issues making a simple coleslaw or carrot and apple salad. If you’re planning on using the food processor in a commercial sense, such as at a restaurant or for a catering service, then you’ll probably want to opt for the Cuisinart model. It comes with a three-year warranty which, according to reviews, is a well-honored policy, as well as a five-year warranty on the motor mechanism; whereas the Kitchenaid only has a one-year warranty. Neither should really give in within any small time period, however, it’s best to always be prepared. Both these models have fantastic build quality. All blades are made from high-grade stainless steel, which won’t rust or get blunt easily. They’re also pretty simple to sharpen, there are plenty of tutorials online. The Cuisinart model is made from ABS plastic, whereas the Kitchenaid is made from Polycarbonate Plastic. ABS generally has a higher strength, whereas Polycarbonate is more flexible and less likely to break under stress. This gives us a little more insight into why the Cuisinart is better suited to dough-making. This difference is something you’re going to want to keep in mind, depending on what it is you plan using the blender for. As we previously mentioned, the Kitchenaid also features an UltraTight Seal mechanism. Many have had issues with the Cuisinart overflowing when filled to capacity. Now, while we don’t recommend filling any blender (or any kitchen appliance for that matter) to capacity for safety reasons, if this is a big issue for you then the Kitchenaid model is going to be your best bet. You can see from this review that it’s difficult to compare these two models. There are so many similarities, so we’ve put together a little buyer’s guide of points to consider when looking at the Kitchenaid/Cuisinart options. These are the main four points that should inform you towards making a decision about which food processor is the one for you. If you’re going to making doughs and nut butters, and tougher recipes, you’ll probably want the ABS plastic-built model. Points two and three, referring to kitchen size and professional use, should also help you make a pick between the shape and size of the two blenders, as well as the warranty options. You’re definitely not going to want to install something meant more for home use in a professional kitchen where it’s going to be used multiple times a day, every day, for months at a time. Lastly, the price is a factor – and when it comes to replaceable parts, it’s going to be a factor you really want to consider. Both blender sets have reasonably priced replacements at similar prices, although reading through reviews you’ll see which parts on each model wear through the quickest. For example, a certain attachment on one blender might wear through quicker than the same piece on another, and if that’s the most expensive attachment you could end up spending a lot more than expected. Which is the Better Food Processor – Kitchenaid or Cuisinart? The Cuisinart DLC-10S is the blender that we felt came out on top overall. When one accounts for features, abilities, and extras, the Cuisinart comes out slightly on top, thanks to its higher wattage, ability to handle dough, and slightly smaller form factor. Wwe think this blender is the winner out of the two – but only by a hair’s breadth. While there are fewer blend speeds, and no UltraTight seal mechanism, you’re still getting a better shredding blade, a better motor, and better warranty to boot. As long as it serves its purpose in your kitchen, and teaches you something new about cooking, it’s the right purchase. The delicious smoothies, nut butter, pesto and hummus you’ll make with your new blender, amongst a myriad of other things, are almost secondary to the blender itself.